2015 - Custom designed website for Testa Construction in Boardman, OH. 2014 - Custom designed website for Beverly Hills Floors in Youngstown, OH. 2014 - Custom designed website for Belfast Engineering in Carlsbad, CA. 2014 - Custom designed website for Morley Building & Remodeling in Portland, OR. 2014 - Custom designed responsive website for Michael's Cabinet Designs in Boardman, OH. 2014 - Custom designed responsive website for Vista Acupuncture in Vista, CA. 2014 - Custom designed responsive website for Abiqua Wind Vineyard in Scotts Mills, OR. 2013 - Custom designed website for Great Value Wedding services by The Inn on Pine in Silverton, OR. 2013 - Custom designed website with a Volusion Shopping Cart for Salt Junkie Tackle in Aurora, OR. 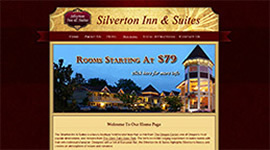 2012 - Custom designed website for The Silverton Inn & Suites in Silverton, OR. The Inn's incredible lodging experience includes rooms with their own individual character. 2012 - Custom designed website for Alighthealer in Silverton, OR. Alighthealer offers individual healings, group retreats, space clearings, and classes. 2012 - Custom designed website for United Physicians Group in Albuquerque, NM. UPG is a nutrition center that offers weight loss management. 2012 - Custom designed website for Oregon Home Repair Service in Beavercreek, OR. OHRS offers 35 years of construction experience in building and remodeling homes. 2012 - Custom flash website re-designed for photographer Hank Keeton in Scotts Mills, OR. Displays Hanks photography galleries. 2012 - Custom designed website for Blue Bird Montessori in Silverton, OR. Montessori children's school founded for families by families. 2011 - Custom designed website for Silverton Beverage in Silverton, OR & Salem Beverage in Salem, OR. Website with products & monthly specials. 2011 - Custom designed website for Northwest Institute for Healthcare Training in Salem, OR. NWIHCT offers healthcare training and continuing education in Salem & Portland Oregon. 2011 - Updated website for Pink Stinker Pepper Spray in Beavercreek, OR. Hot Pink 'em™ is a maximum strength, hot pink pepper mace defense spray with a visible pink skin dye assailant marker. 2011 - Custom designed website for Magic Carpet Cleaning and More in Silverton, OR. Magic Carpet Cleaning has served the Willamette Valley of Oregon since 1992. 2011 - Custom designed website for Silverton Art Association in Silverton, OR. The SAA's goal is to increase the public understanding of the arts for present and future generations. 2011 - Updated website for Prenderosa Christmas Tree Farm in El Dorado, CA. The farm sells Christmas trees, wreaths, and holiday decorations at retail and wholesale prices. 2011 - Custom designed website for The Marion County Development Corporation in Salem, OR. MCDC's grant program supports the arts, heritage, humanities & culture in the Marion County region of OR. 2010 - Standard html/css website for Larsen Flynn Insurance in Silverton, OR. Larsen Flynn Insurance is a highly reputable professional independent agency that provides auto, home, farm, business, bond, health and life insurance. 2010 - Standard html/css website for The Silver Grille in Silverton, OR. A comtemporary bistro featuring fresh & savory Willamette Valley Cuisine prepared by chef Jeff Nizlek. 2010 - Standard html/css with flash website for The Lodge at Detroit Lake in Detroit, OR. The Lodge sets the benchmark for fine lodging in the beautiful little town of Detroit Oregon. 2010 - Updated - Standard html/css website for The Inn on Pine in Silverton, OR. The Inn on Pine is a 1920s vintage Prairie Craftsman home bed & breakfast. 2010 - Updated - Standard html/css website for the East Valley Winery Association in Oregon. The East Willamette Valley is home to more than a dozen boutique wineries. 2010 - Standard html/css with flash website for Green Leaf Medi in San Diego, CA. The company is no longer in business. 2010 - Standard html/css website for Hanson Vineyards in Woodburn, OR. Hanson Vineyards is a small boutique winery in the northern Willamette Valley. 2010 - Updated - Standard html/css website for Abiqua Wind Vineyard in Scotts Mills, OR. Abiqua Wind Vineyard is a small and family owned operation in the Cascade foothills. 2009 - Standard html/css website for The Chocolate Box in Silverton, OR. The shop features the finest quality chocolates from all over Oregon. 2010 - Standard html/css with flash website for Dinner with the Pro's in San Diego, CA. Website is for a celebrity fundraiser event. 2009 - Standard html/css website for Celt System in Silverton, OR. Celt offers relationship training & brokering. 2009 - Standard html/css website for Rover's Makeover in Silverton, OR. practicing professional dog grooming since 1979. 2009 - Standard html/css website for Silvertonsbest.com - Silverton, OR. Website offers events and local business information. 2009 - Standard html/css website for Executive Delivery Service in Branson, MO. EDS offers professional courier services. 2008 - Standard html/css website for Women's Christian Fellowship in Carlsbad, CA. WCF is a prayer / bible study group for women. 2007 - A full flash website to display a porfolio for Aaron Belfast. 2006 - Standard html/css website for Associated Medical Group in Vista, CA. AMG offers Chiropractic, Acupuncture, Oriental Medicine, and Weight Loss. 2005 - A full flash website for a Geotechnical Engineering company in San Diego, CA. Website is no longer active the preview is on ATD's server. Copyright © 2006 - 2014 Abiqua Tech & Design llc. All Rights Reserved.